Spring Cloud Data Flow is as easy as 1-2-3. Read on and see how it's done. I just wanted to register here an experience that made me smile yesterday—making the rapidly improving Spring Cloud Data Flow wiggle from (Spring Boot) start(-ers) to service in a matter of minutes! The only pre-requisite is that you have a Redis instance runnning. My Redis instance is running on 127.0.0.1 and it required no further configuration for Spring Boot to find and work with it. 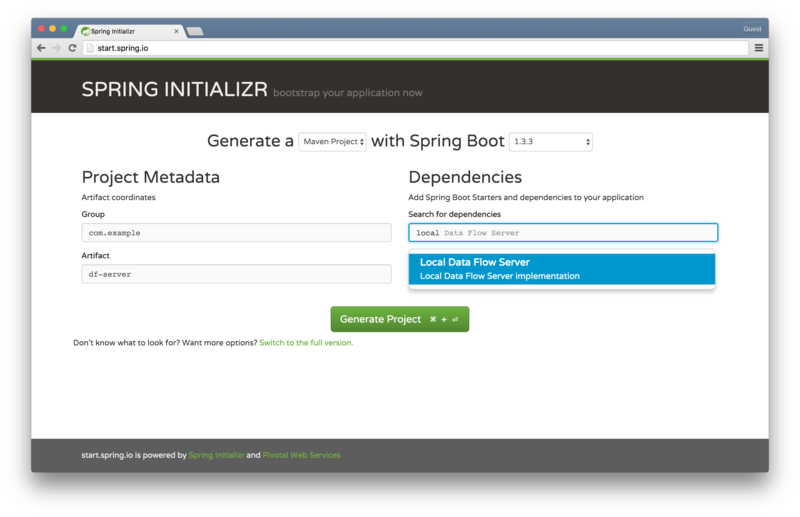 We’ll use the epic Spring Initializr to make short work of generating our applications. Remember those silly Apple commercials, "There’s an App For That"? Nevermind that, there’s a checkbox for that! Let’s see if you like the experience as much as I did! Go to the Spring Initializr and select Local Data Flow Server and name the artifact df-server. This will be used to standup a local Data Flow service—a REST API and some persistence logic—to orchestrate and store information about streams and tasks. In the old Spring XD world, this was called the Spring XD Admin Server. Run mvn spring-boot:run in the root of the df-server project and the application will spin up on port 9393. TIP: You’ll know you’re (probably) home-free when you see the welcome ASCII artwork! TIP about the TIP: so, that’s probably not true. It might fail for all sorts of reasons (like conflicting ports for the service or for the embedded H2 database), but quality ASCII artwork has been shown to be therapeutic in (my) study... (of... me). Go to the Spring Initializr and select Data Flow Shell and name the artifact df-shell. This will be used to standup a Data Flow shell powered by Spring Shell. Run mvn spring-boot:run in the root of the df-shell project. You should be able to interact with the Data Flow server, running locally, by default. Try it out by issuing the module list command. You should see a table of all the inbuilt components that Spring Cloud Data Flow already knows about. Go to the Spring Initializr and select Stream Redis and name the artifact logging-sink. We’re going to use Spring Cloud Stream, which builds atop Spring’s MessageChannel abstraction and the component model in Spring Integration to make concise the work of describing and integrating messaging-based microservices, to build a custom module that logs incoming messages. We’ll then deploy and orchestrate this module with Spring Cloud Data Flow. Spring Cloud Data Flow is a powerful way to describe complex integration, batch and stream processing workloads in terms of small Spring Boot-powered modules. There are several types of modules. A source produces data, often on a fixed schedule, that downstream components may consume and process. A processor takes data in, does something with it, and writes data out. A sink merely takes data in but does not produce anything to be sent out. These components compose nicely together to describe any kind of potentially ceaseless workload (internet-of-things sensor data, 24/7 event processing, online transaction data ingest and integration scenarios, etc.) Ultimately, a source is usually a Spring Integration inbound adapter. A processor is usually any kind of Spring Integration component (like a transformer) that takes data in and produces data out. A sink is usually a Spring Integration outbound adapter. A task describes any workload that will, ultimately, stop. 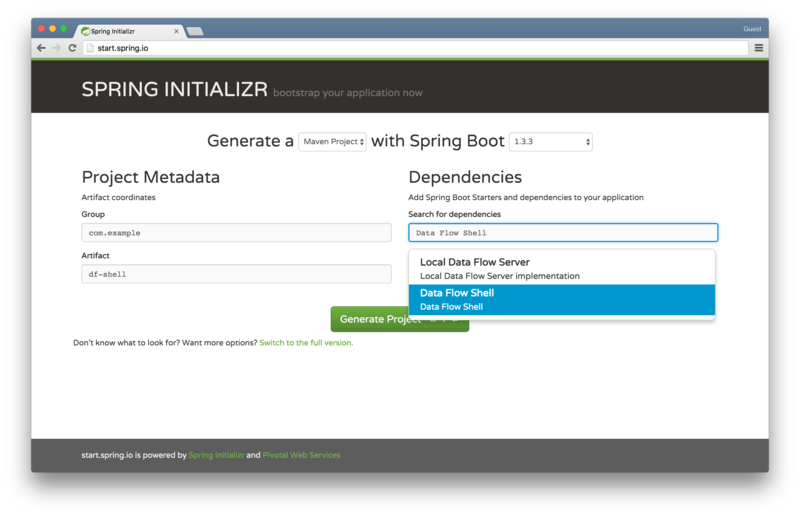 It might be a simple Spring Boot Command Line Runner or a Spring Batch Job. Spring Cloud Data Flow doesn’t have particular knowledge of Spring Integration, though. It just knows about Spring Cloud Stream and well-known Spring MessageChannels like input and output. It doesn’t care what is on the terminuses of those channels. Spring Cloud Data Flow doesn’t have particular knowledge of Spring Batch, either. It just knows about Spring Cloud Task. In the way that the UNIX sh shell environment lets us compose arbitrary many and arbitrarily sophisticated solutions from singly-focused command-line utilities by passing data to and from stdin and stdout, respectively, so too does Spring Cloud Data Flow let us compose arbitrary many and arbitrarily sophisticated solutions from singly-focused messaging components. This is a simple Spring Cloud Stream binding. The Sink.class is an interface that defines a MessageChannel input(). Spring Cloud Stream will turn that into a live, named conduit to a message broker (in this case, Redis, though the default for Spring Cloud Data Flow will likely change to RabbitMQ in coming months) that any of our messaging code can work with. The example uses Spring Integration to print incoming message data out on arrival. Let’s first register our custom module with Data Flow and then compose a stream that takes incoming messages containing the time from a time component and then logs the results. First, mvn clean install the logging-sink project so that it’s resolvable in the local Maven repository. Spring Cloud Data Flow uses a pluggable strategy to resolve instances of custom modules. In our example, it’ll try to resolve them in our system local Maven repository. Tail the logs to confirm what you already know in your heart of hearts: our custom logging-sink is working! To the cloud! We’re using the Local Data Flow Server. There are other implementations available for processing fabrics like Cloud Foundry. The Cloud Foundry Data Flow Server spins up application instances instead of local Java processes. Now, building a scalable data ingest and processing stream is as easy as cf push .. and cf scale -i $MOAR! 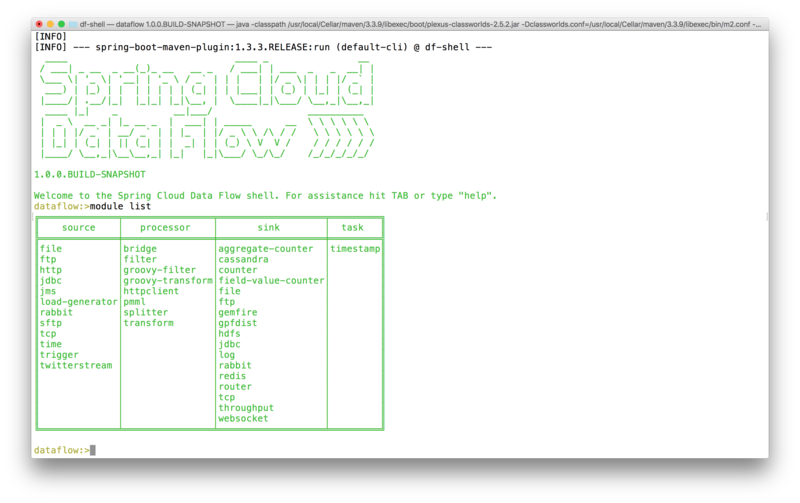 We’re using but a few of Spring Cloud Data Flow’s capabilities! Use Spring Cloud Data Flow to orchestrate any number of messaging-based microservices powered by Spring Cloud Stream. I’d recommend a look at some of the built-in Spring Cloud Stream modules for inspiration.